Espresso Brownies with Peanut Butter Caramel Sauce are so gooey and delicious! Watch out though because you won’t be able to eat just one! The espresso brownies are fudgy and chocolatey with just a hint of espresso and then there’s the peanut butter caramel sauce on top…. oh my! I joined a group called Peanut Butter Bash and monthly we get a peanut butter and mystery ingredient challenge to create a new recipe with. So fun, right? This month was espresso and at first I wanted to try a peanut butter macchiato but it just was not turning out how I imagined but the peanut butter caramel I made for it was phenomenal! So, had to go to plan B. 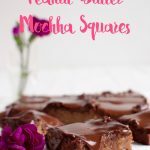 Plan B was chocolate and peanut butter and chocolate is sort of the perfect combination so lets add in some espresso and hello Espresso Brownies with Peanut Butter Caramel Sauce! So the peanut butter caramel sauce was an idea I had but after searching through Pinterest for similar recipes, I stumbled across this perfect peanut butter caramel sauce recipe from The Midnight Baker. Huge hit! So happy with how it turned out on my brownies and I’m imagining all the other recipes I can utilize this sauce for. Brownies are a fairly simple dessert to make. 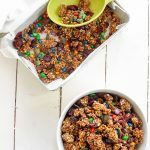 Just mix everything in a big bowl, no equipment is needed and bake for 25 minutes. The trick to good brownies is ingredients and amounts of each ingredient. 3 eggs is perfect for those gooey fudge like type of brownies, a more cake like brownie would require more eggs. I put just a little bit of baking powder so they have a little rise. Chocolate amount is important too, you could use less cocoa powder or do a combination of cocoa powder and chocolate chips to be crazy chocolatey. Yum yum. I am happy with the ingredients and the amounts in this brownie recipe and the added espresso add a really nice touch of extra flavor and a kick of energy because who couldn’t use that? okay, well… my kids could do without the energy kick so I limit them to just one brownie. Mommy can’t have two kids bouncing off the walls all night. 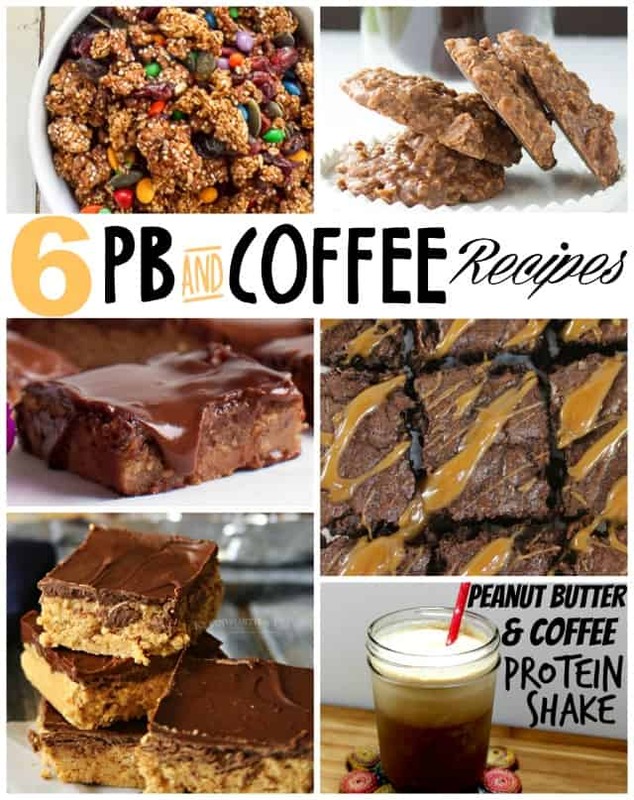 Make sure to check out the members of the Peanut Butter Bash and their amazing recipes with peanut butter and espresso, also! Links are provided below. In a large bowl, add 1 stick butter and melt. Add 3/4 cup cocoa powder, 1.5 cups sugar, 5 teaspoons, 1 teaspoon vanilla extract, .5 teaspoon salt, .5 teaspoon baking powder, 3 eggs and mix well. Add in the 1 cup flour and mix until blended. For brownies, I don't use a hand mixer or anything, just a spatula because it blends quickly. Lightly spray your 8 by 11 cooking dish and add brownie mix. Cook for 25 minutes. When you test with a toothpick, it should be mostly clean but some brownie will stick to it. These brownies are gooey so look for the top of the brownies to get that slightly crispy layer on top. On the stove top, put a medium sized pan on medium heat to start the peanut butter caramel sauce. Add .5 cups peanut butter, .5 cups heavy cream, 1/4 cup brown sugar, and 2 tablespoons of corn syrup. Whisk well until it slightly bubbles and will be at a nice, thick and creamy consistency. When completed blended, the sauce is complete. Drizzle peanut Butter Caramel Sauce on top of Espresso Brownies. 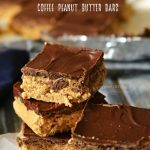 Coffee and Peanut Butter Bars from Kliensworth & Co.
Mocha No Bake Cookies from Cookie Dough and Oven Mitt. These look soooo delicious! This flavor combination is one of my favorites peanut butter goes so weel with both coffee and chocolate. The espresso really does bring out a nice flavor! These look delicious! 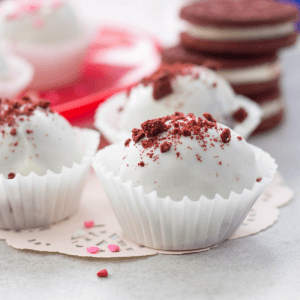 I may make these for a cookie party! Yummmm! These are right up my alley! Coffee? Check! Peanut butter? Check! Chocolate? Double-check! Cannot WAIT to make these! Oh my gosh! These look amazing!!!!! These looks so fabulous!! I have to try this for my kiddos! Holy Smokes!! This espresso brownies sounds dangerously GOOD! I pinned this recipe so I hope to make it soon.